Over a year ago, my wife and I decided to start tracking our net worth. After reading up on other personal finance bloggers and their net worth, it felt like it was time for us to start keeping track of ours too. Instead of tracking our net worth each month however, we decided to track it every 3 to 9 months. Tracking assets like the value of our home, for example can be very volatile month to month. That is why a 3 to 9 month interval seems to be a better option for our family. Unlike our home value, keeping track of investments like cash, certificates of deposits, and stocks can be very helpful. It gives us a snapshot of the overall picture of our finances, which is both motivating and fun. On the flip side, keeping track of liabilities over the long term has proven beneficial as well. We can see our remaining home balance fall every time we report along with our auto loan. 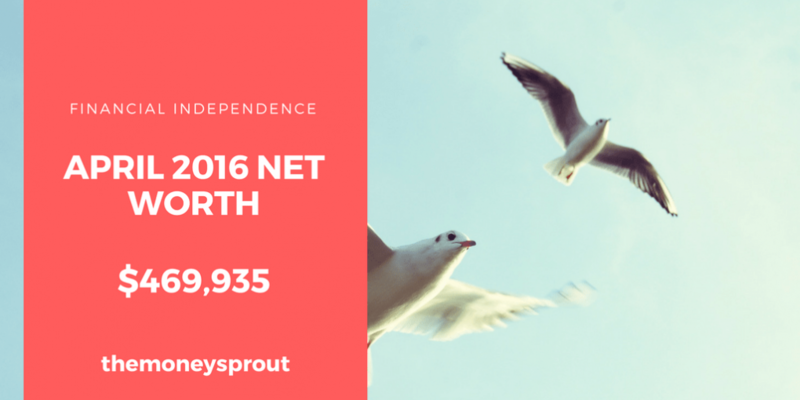 As of April 15th, 2016, our net worth is $469,934.98! Just like in our first two reports, we still believe that reporting on certain assets like a mortgage can be misleading. This is why we choose to only report our net worth only a couple times per year. While we don’t like reporting every month, my wife and I hope that by calculating our net worth every 3 to 9 months we can see progress in our results. Our net worth in April 2016 rose by 3.9% compared to last June. That was an increase of $17,835.64 over those 10 months. To keep things simple, my wife and I decided not to report the value of our automobiles as an asset. We have however, decided to report the remaining loan balance on my wife’s van. The stock market has been on a wild roller coaster the past year or so. Since we have been pumping money into our investments over the last 10 months, it is no surprise to see these increases. As these investments grow and start earning dividends, I expect our investments to really start growing nicely for years to come. Our current cash includes all of our checking and savings accounts. We saw a big drop in cash since last reporting. Most of this was due to moving a lot of money into the stock market and still paying off holiday bills from last Christmas. I also spent a bunch of money fixing up my car which put a sizeable dent in our cash reserves. The big drop is actually a wake up call to us. We really need to focus on pumping up our cash reserves. I am not a huge fan of reporting on our home value, but it is one of our largest assets so we need to include it. We are currently using the Zillow estimate on our home, which is calculated directly through Personal Capital. This asset will likely see a bunch of ups and downs each time I report our net worth – which is another reason not to calculate it every month. This is the most volatile asset that we currently have. While we saw a nice bump in our home value since last June, it could very easily be back down in a couple of months. Overall, our home value had a very nice jump and our total investments certainly shot up from all the new money we are investing. Unfortunately our cash has declined a bunch, which gives us something to focus on in the future. As you can tell, we have taken on more credit card debt – which also shows why our cash had a big decline. Since last reporting, both our mortgage and car loan balances dropped – as expected. Our credit card balances shot up due to holiday spending and major repairs to my car. Overall I think it was a good 10 months and we took some positive steps towards building our net worth. It is nice to see some of our liabilities drop (which they should) like our mortgage and car loan. Growing our net worth is just as much about reducing our expenses (liabilities) as it is about growing our assets. That is one of the reasons why we decided to start reporting our net worth – to show our work on reducing liabilities.